Eating raw eggs is a controversial subject in the United States and has been for years. Public health organizations unanimously suggest cooking eggs and any products containing eggs as a way to lower your risk of getting sick from contamination. Despite these recommendations, many people tout the benefits of consuming raw eggs. With more information from both sides of the argument, you can make an informed decision about your own diet. Keep in mind that not all of these advantages represent a practical difference since the quantities of the given nutrient in the egg to begin with are tiny. Vitamin D is the perfect example. A raw egg has 41 IU while a hard-boiled one has 26.5 IU, but even the raw egg only has ten percent of your recommended daily value. Therefore, dropping it to seven percent will not change that fact that you need to consume a lot more vitamin D than that found in an egg each day. For some of the other nutrients, however, the difference is actually important. Just one raw egg, for example, can provide a woman with almost 35 percent of the Adequate Intake level, but this drops to 26 percent for hard-boiled ones. Considering the average person only consumes 302 milligrams daily, this is a significant difference in favor of eating raw eggs. Eggs are among the best sources for protein, having all nine essential amino acids in ideal ratios. When you eat the egg raw, however, you may absorb less. One study found that only 50 percent of protein from raw eggs was digested, compared to 90 percent in cooked ones. To put it another way, the protein found in cooked eggs is 80 percent more digestible. Biotin is water-soluble and a B-vitamin also called B7. It helps the body produce fatty acids and glucose and assists with pregnancy. 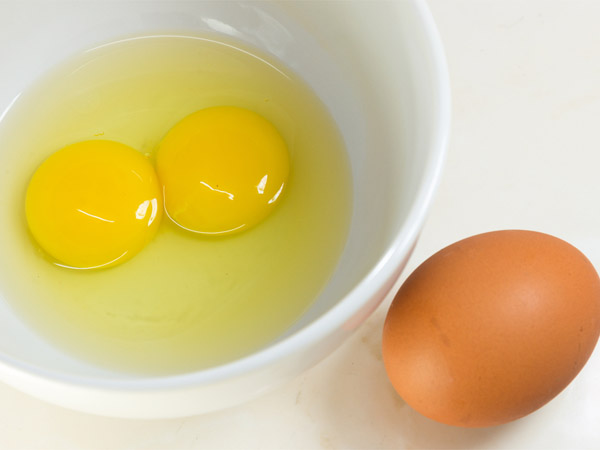 Egg yolks are a good source of biotin, but the avidin in raw eggs decreases this. Avidin is a protein that binds with biotin in your small intestine, stopping its absorption. The avidin is destroyed by heat, no longer posing an issue. On the bright side, even eating raw egg makes it unlikely that you will get a biotin deficiency; you would need to have a dozen or more daily for an extended amount of time. The reason most people avoid raw eggs is the higher risk of Salmonella, harmful bacteria that can be on the eggs shells or within the egg. Eating a contaminated egg may lead to food poisoning and symptoms like fever, headache, nausea, diarrhea, and stomach cramps. The symptoms can last three to seven day and typically appear within six to 48 hours after eating raw eggs. The good news is that your risk of eating a contaminated egg is extremely low, with one study finding just one of each 30,000 eggs in the U.S. has contamination. Egg shells used to be a common source, but improvements such as changes to pasteurization have reduced the risk. Now, the USDA says it is safe to consume raw eggs that are pasteurized. Young children and infants: Their immature immune systems increase their risk. Pregnant women: Although rare, Salmonella can lead to uterine cramps that cause stillbirth or premature birth. The elderly: Those over 65 have a higher risk of dying from a food-borne infection. Age-related changes to the digestive system and malnutrition also play a role. Those with compromised immune systems: Those with chronic disease have a weaker immune system and greater vulnerability to infection. Those with malignant tumors or HIV should be particularly careful. Anyone in the above categories should avoid consuming raw eggs or foods with them. Be wary of homemade foods like ice cream, cake icing, and mayonnaise. You get to decide whether eating raw eggs is right for you. Weigh the risk of food poisoning and less protein absorption with the boost to vitamins and minerals. Healthy adults are free to make their own choices, but those in one of the at-risk categories above should not go raw. If you do choose to eat raw eggs, minimize your risk by choosing pasteurized eggs. These have been heat-treated as a way to kill bacteria, but keep in mind that this process may slightly reduce the level of certain minerals and vitamins, making it less than ideal if the nutrition boost is why you want raw eggs. You should also never assume free-range eggs are safer. While caged hens have a higher risk of Salmonella from stress, it is easier to clean in this controlled setting. Free-range hens have a higher risk of getting Salmonella from the environment. Also take care to avoid eggs which are cracked as this increases the risk of surface bacteria from the shell getting into the egg. Some people cannot eat raw eggs because the texture and taste are too much for them. You may simply find it impossible to swallow an egg raw without gagging or vomiting. For those who don’t like the taste or texture of raw eggs, mix it with other foods. Make a smoothie with yogurt or juice, fresh fruit, and a raw egg. You can also look for other foods containing raw eggs. Numerous homemade recipes contain raw eggs, such as Hollandaise sauce, cookie dough, eggnog, custard, ice cream, Caesar dressing, and mayonnaise. The versions in grocery stores and restaurants always have pasteurized eggs as this reduces the risk of Salmonella, but homemade versions may or may not use pasteurized eggs.